On 24 October 1789, the deposition of Emperor Joseph II was proclaimed by the Insurrection Committee set up by the Belgian patriots (the uprising is known as the Brabantine Revolution). The Austrian garrisons were expelled from Ghent on 17 November and from Brussels on 13 December; on 21 November, Mons was proclaimed a "patriot" town and abandoned by the Austrians. The revolution was completed with the seizure of Namur and the entrance of Van der Noot's army in Brussels on 17 December. On 21 December 1789, the States General of Hainaut issued a manifesto proclaiming the nation "free, independent and released from the oath of allegiance to Joseph II". The manifesto bore the seals of the three States, each of them being counter-sealed by a stamp bearing the arms of Hainaut. The seals were appended by tassels of red, yellow and black silk. On 11 January 1790, the Belgian provinces signed a treaty of union and set up the Congress of the United Belgian States. The treaty was signed by representatives of the provinces of Brabant, Gelderland, West Flanders, Hainaut, Namur, Tournai, Tournaisis and Mechelen. The Congress ordered a seal bearing the arms of the signatory provinces, completed with the arms of Limburg, Luxembourg and Flanders. The United Belgian States were short-lived because of the political divisions among its rulers. Namur was seized without fighting by Marshal de Bender on 25 November 1790, as was Mons on 30 November, and the Austrian rule was quickly reestablished. Source: E. Poncelet, Le drapeau des volontaires du Hainaut en 1790, 1908. Flags with horizontal stripes were used during the Brabantine Revolution. On a drawing showing those flags, the colours are arranged red-black-yellow. 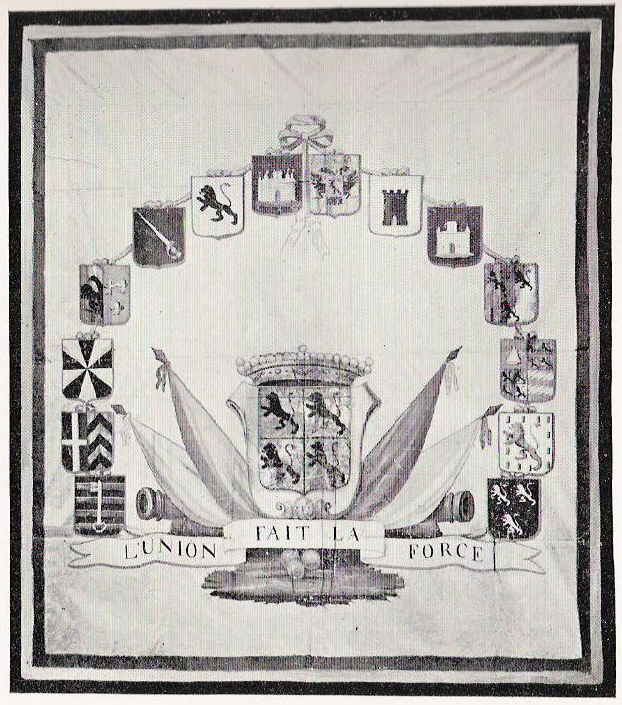 The flag used by the Hainaut volunteers in 1790 is described in the booklet Le drapeau des volontaires du Hainaut en 1790, published in 1908 by Édouard Poncelet (1908). In his monography, Poncelet, Curator of the State Archives in Mons, gives an historical account of the Brabantine Revolution, with special emphasis on Hainaut and Mons, and then describes in detail the flag and its history. Two plates placed in the beginning of the booklet shows, in black and white, the obverse and the reverse of the flag. In Hainaut, allegiance to the new regime of the Belgian United States was not complete. Among the ceremonies set up to raise patriotism, the blessing of colours was of particular significance. On 13 February 1790, the ceremony of inauguration of the colours of the national troops and of the oath of the patriotic milice, patroned by Mrs. Dirickx, wife of the General Commander, was organized in the chapel of the Daughters of St. Mary in Mons. In Mons, the first volunteers' companies, set up on 25 November 1789 to defend the new state, were not successful. The pay offerred to the volunteers caused a general abandon of the workshops useful to the war effort, such as taneries and arms factories. On 2 January 1790, the States of Hainaut disbanded the companies and asked the volunteers to enroll in regular companies. In parallel, a corps of true volunteers, not paid, was set up. On 23 January, four companies were set up in Mons, while a fifth company was added in July. Following the example of Mons, volunteers' companies were set up in several municipalities of Hainaut in April-September (Jemappes, Leuze, Ath, Binche, Ghislenghien and the neighbouring municipalities, Soignies, Élouges, Pommerœul, Braine-le-Comte, Chimay, Obourg, Beaumont, Saint-Ghislain, Le Rœulx, Naast, Hornu, Silly, Frasnes-lez-Buissenal, Wasmes, Saint-Sauveur, Dour, Chièvres and Enghien). Most of these companies used as their colour a yellow flag with, on one side, the arms of Hainaut, and on the other side, the name or the arms of the municipality. The new volunteers' companies, not really organized and disciplined, were not too successful, and several problems broke out locally. For instance, the sending of a company from Mons and Ath to Enghien because of a risk of insurrection there caused protests; the States recalled on 10 April to the Department of War that the volunteers of Mons were not supposed to be stationed in other towns. The volunteers of Mons asked for a colour, which was granted on 4 February 1790 by the States and confirmed by Decree on 8 April. The officers of the company proposed a design for the flag and drafted a proposal of ceremony, which as accepted on 22 July and slightly modified the next day. The flag is 1.65 x 1.65 m, made of a double-sided piece of white silk, oil-painted and gilded. The obverse and the reverse have a black- yellow-red border. The obverse of the flag bears the shield of arms of Hainaut ("Quarterly, 1. and 4. Or a lion sable armed and langued gules, 2. and 3. Or a lion gules armed and langued sable"), surmounted by a crown with 21 pearls, three of them (left, middle and right) protruding upwards. The shield is surrounding by flags and lies on cannons. The motto "L'union fait la force" (Unity makes strength) is written on a ribbon placed under the shield. - Chièvres, "Gules three lions argent". Most of these arms have been kept by the modern municipalities and are the source of the municipal flag (complete design, elements, or colours). The reverse of the flag bears a reddish cross, surrounded by a sun. The motto "Nous vaincrons sous ce signe", the adaptation to French of Constantine's labarum motto In hoc signo vinceres (with "we" instead of "you"), is written on a ribbon placed under the cross. The name of the painter who realized the flag has not been recorded; according to the accounts of the State of Hainaut for year 1790, the painter Malherbe was usually commissioned for such items. P.P.J. Harmignie (Mémoires sur l'histoire de la ville de Mons, 1789-1801 - published in 1882 by Jules De Le Court et Charles Roussel) gives a different rendition of the flag. The obverse is described as bearing the joint shields of Hainaut and Mons (instead of the shield of Hainaut alone) and the motto as "L'union en fait la force" (instead of "L'union fait la force"). The reverse is described as bearing an angel holding a cross with the writing "Vous vaincrez par ce signe". Poncelet does not believe that two different flags were blessed during the ceremony, even if the ceremony was announced on 12 August as "the blessing of the flags", because all the other available written records mention only one flag. We should, of course, consider Poncelet's description as the right one, since there are photographies of the flag in his booklet. After the reestablishment of the Austrian rule, the volunteers' companies were disbanded. The flag of the Hainaut volunteers' company was transferred to the States of Hainaut, and later to the State Archives in Mons. In 1940, a blaze caused by the German bombings destroyed more than 90% of the State Archives of Mons. The volunteers' company flag has not been seen again since. 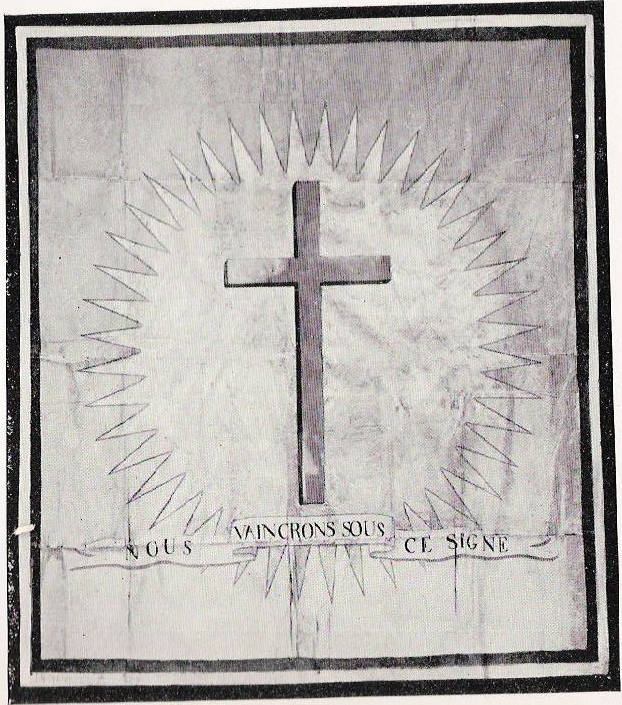 The images and descriptions by Édouard Poncelet might be the only source on this flag. According to Poncelet, only five flags from the Brabantine Revolution have been kept, all of them in the Royal Museum of Decorative Arts in Brussels.